The scale and performance of AWS, coupled with petabytes of data staged for analysis in Amazon Simple Storage Service (Amazon S3), allows for an unprecedented opportunity to drive geospatial usage in the cloud. The goal of this program is to help participants accelerate the development of innovative algorithms, tools, and source code across a wide variety of geospatial applications and focus areas. In addition to funding, participants receive computing resources, training, and mentorship from AWS. Interested applicants should apply directly to participating organizations. See below for more info. Funding – Participants are funded for their work for the duration by the host organization. AWS Credits – Participants receive AWS Promotional Credits that can be redeemed towards most on-demand services, except for Reserved Instances, Mechanical Turk, sign-up and activation fees, and Marketplace purchases. Training – We provide participants with learning opportunities, including access to internal AWS teams working on topics like machine learning. Participants also have access to tutorials on how to work with geospatial data on AWS. Earth on AWS – Participants can access geospatial data staged for analysis on Amazon S3, including datasets such as Landsat, Sentinel-2, Sentinel-1, NEXRAD, GOES-16, SpaceNet, NAIP, Terrain Tiles, MODIS, and GDELT. Participants will also have access to customers already working with geospatial data on AWS that have shared their stories and architectures, available at https://aws.amazon.com/earth. Azavea: Azavea is a B Corporation that creates geospatial software and data analytics for the web. Its mission is to advance the state-of-the-art in geospatial technology and apply it for civic, social, and environmental impact. They are also a former winner of the AWS City on a Cloud Innovation Challenge. Since 2001, they have been stretching the possibilities of geospatial technology to enable people to answer complex questions in a wide range of domains: urban ecosystems, water, infrastructure planning, economic development, public transit, elections, and public safety. Apply with Azavea. Development Seed: Development Seed uses massive earth data to solve big social and environmental problems. Their projects can be both big and small. They are moving NASA’s earth imagery to the cloud, applying machine learning models to map the most under-mapped areas, and building data pipelines to understand the world in real time. They work with different types of data, from massive earth data to disease tracking to real-time polling data. They combine and analyze data to derive insight and build tools that tell powerful stories. They strategically use open data to drive social and economic development around the world. Apply with Development Seed. Element84: Join the Element 84 team to tackle challenging problems in a small company environment invested in continuous innovation and personal growth of its employees. Working at Element 84, you will do meaningful work, helping advance the state of the art in Earth Science and Data Analysis. 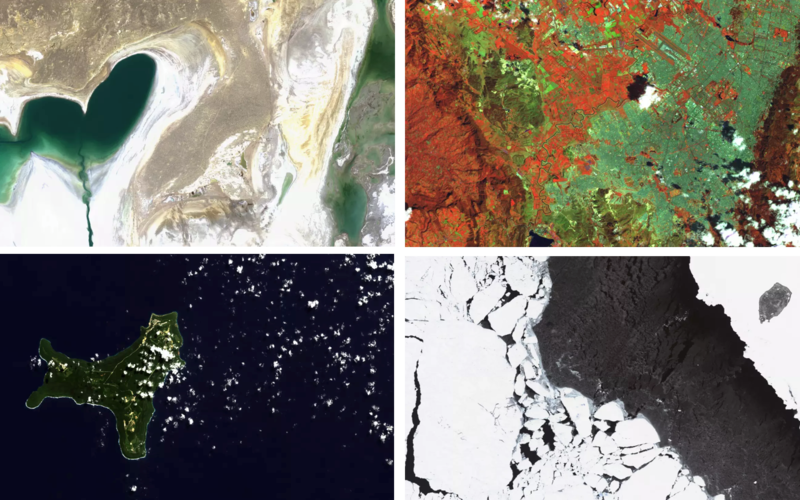 Together, you will visualize complex processes, build new algorithms, and apply machine learning techniques to enable scientists to sift through petabytes of NASA’s Earth observation data to discover new insights about our planet. Apply with Element84. Sinergise: Sinergise is best known for their award-winning Sentinel Hub service but also develops large-scale systems for land administration in Europe and Africa. After successfully cracking the challenge of processing petabytes of satellite imagery data in a matter of a seconds, they have realized they need to train computers to understand the data as there are simply not enough remote sensing experts out there to check everything. Sinergise invites you to join their small team of machine learning experts to help with early monitoring of natural disasters, assisting farmers and many other challenges. Apply with Sinergise. SkyWatch: SkyWatch is on a mission to make Earth observation data accessible to the world. Hundreds of trillions of pixels of our planet are captured from space every day. Utilizing experience in building satellite data aggregation software, their team is developing EarthCache™, a robust platform allowing developers to discover and access the world’s remote sensing datasets. Apply with SkyWatch. For more information about Earth on AWS, visit our page here.